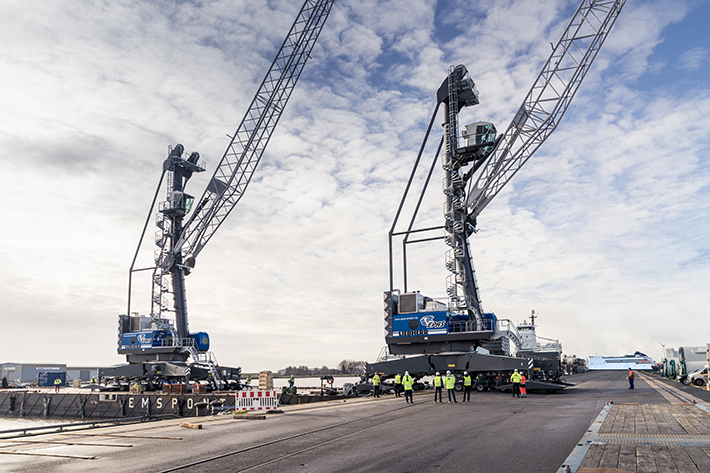 In order to improve logistics processes of the Nordkai terminal of Emden in Germany, the German port handling company Ems Ports Agency & Stevedoring (EPAS) Beteiligungs GmbH & Co. KG just acquired two new port mobile cranes Liebherr LHM 420. Both have a lifting capacity of 124t and a 18m outreach. Thanks to the Sycratronic lifting system, only one person can operate the two machines simultaneously . The electronic synchronisation allows that, with 100% of the maximum lifting charge against 75% manually. This productivity gain is also obtained by the ability to handle several ships in the same time. This purchase is « the prelude to a series of investments we are planning to provide our customers with the best possible service and competitive positioning in the future », explained Heinrich Smidt, Managing Director of Epas.